My Creative Existence: Inkurable Stampers - October Challenge! This month at Inkurable Stampers, we're getting SERIOUSLY SPOOKY!! Your challenge this month is to create something spooky - think all things spooky and scary - skeletons, crows, ghosts, ghouls, black cats, Poe, gothic, graveyards, witches, demons, Halloween - you get the picture! I have used my favourite goth girl stamps from Stampotique again! 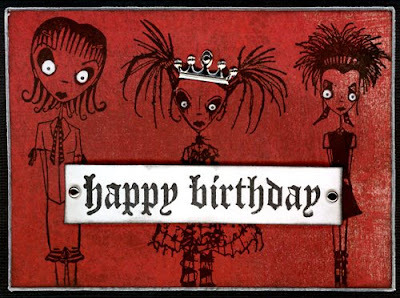 Don't they go well with that great gothic script "Happy Birthday" stamp??! Love them! This month, your stamp doesn't need to be spooky - as long as you use at least 1 stamp in your spooky creation it will meet the criteria. You can see the full challenge details here, and this month's prizes here. Entries need to be in by midnight 31st October 2008 - please see the sidebar at Inkurable Stampers for more info on how to submit your entry. There is also an extra special Nicho challenge this month, sponsored by our new sponsor "Paper Forest Designs" so make sure you check it out as there is sure to be some awesome eye candy on display!